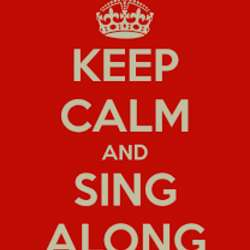 Welcome to the next edition of our Singalong evening! You don't have to be neither Placido Domingo nor Madonna - just bring your voice, and let's have fun together! You play an instrument and would like to bring it with you? That's even better, but not mandatory. When looking back to the last events, it seems like a good idea that the participants bring up suggestions of what they would fancy to sing, and then tell the others in advance, allowing them to get at least a little bit acquainted with the song. Reason: when most people discover the tune AND the lyrics at the very moment thay are singing, everyone has his/her eyes fixed on the screen / the sheet and that's neither good for your breathing nor very enjoyable and relaxed. So, let's exchange ideas in advance - which doesn't mean that other stuff couldn't come up spontanously, of course.